Nishiizu town is located on the west coast of the beautiful Izu Peninsula, just three hours south-east of Tokyo. Welcome to Nishiizu, the sunset town that will remain in your heart forever. Nishiizu is known as the town with the best sunset in Japan. Depending on the season and location, the same sunset creates various different moods. Tinting the cotton-candy clouds romantic shades of pink every evening, Nishiizu's picturisque sunset is undoubtedly the biggest attraction of the town. The Sanshiro island is an island located 200m away from the mainland. However, when the tide is low, the water retreats, revealing a bridge that was hidden beneath the waters. This rare land formation is known as a Tombolo. Walking on the Tombolo landbridge, you can access the Sanshiro island by foot during low tide! Nishiizu town has a wide range of activities for visitors, from thrilling water activities to awe-inspiring art museums. 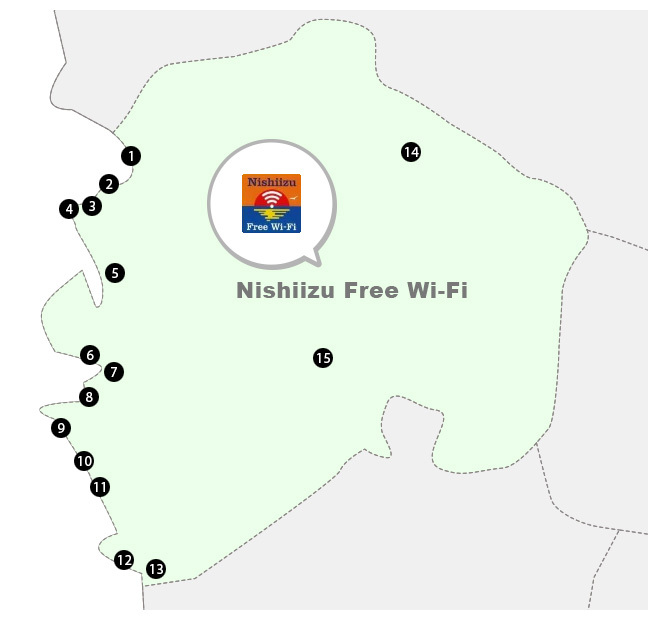 No matter what is your travel style, when you come to Nishiizu, be prepared to leave rejuvenized! The Izu Peninsula Geopark is designated as a UNESCO Global Geopark in April 2018. In Nishiizu, there are large, widely distributed strata from the submarine volcanic era, and you can observe these cross sections on the cliffs throughout the coastal areas. Don't you want to find out more about the beautiful landscape and the secret of its birth? When it comes to food, Nishiizu town is the best of both worlds - fresh ingredients from both the seas and the mountains are readily available in this town. Other than food, Nishiizu is famous for glass artwork created with materials found locally. With fresh food and exquisite artwork, you will definitely think back fondly about your time in Nishiizu. In the Dogashima hot spring area, many hotels offer relaxing hot spring baths with mersmerizing views. You can go to an onsen famous for its sunset views, or an outdoor bath that is located right on a cliff! If hot springs are your thing, you should definitely come to enjoy these blessings from Mother Nature. Delicious food gathered from the mountains and the sea, traditional ingredients. Please try and enjoy the special food of Nishiizu town. "Dougashima hot spring area" where the best accommodations are gathered on the west coast of the Izu Peninsula. Nishiizu town in Shizuoka prefecture is located in the center of the west coast of the Izu peninsula. Copyright © West Izu. All rights reserved.